If you’ve been reading the reviews on !upstarter for any length of time, you would realize by now that I’m a big fan of Chris Murray. Ever since I saw him open for Skavoovie and the Epitones and Less Than Jake in Lawrence, KS ages ago (1996 maybe? ), I’ve been hooked. Time has seen several new releases since the 4-Track Adventures of Venice Shoreline Chris, each of which has been rock solid in its own way. Why So Rude is no exception. If anything Chris Murray, now as a three piece combo, is more solid than ever. The new release is a culmination of time spent playing as CMC over the last few years and newly recorded versions from the Chris Murray and King Apparatus back catalog. The band consists of Ben Farrar on percussion/backing vocals, Eddie “Chiquis” Lozoya on bass/backing vocals and Chris Murray on vocals/guitar. Frankly all three of these guys bust out the stops at their respective musical posts. The bass is smooth and rolling. The symbol hits are second to none, and the vocals compliment the songs like a glove to a hand. Though this is a slightly different lineup than when I last saw the CMC. Bass duties were once upon a time performed by Jeff Roffredo, but that was a few years back. None the less Why So Rude lays down 13 tracks: some new, some old, all good. Personal Favorites include the opener: I need Water and the title track: Why So Rude. The cover of Maga Dog and the re-recording of Michael and Anne are top notch as well. 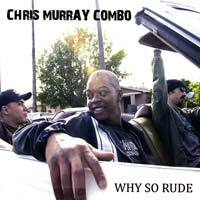 If you like your Ska, Roots and Reggae full of genuine soul, compelling song writing, sincere vocals and subtle harmonies, do check out the Chris Murray Combo. You shan’t be disappointed.